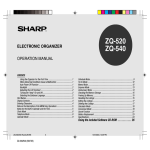 • This Organizer is not designed to visit Web sites or transfer/receive e-mails by using the URL or E-mail addresses you will store. switch and then release ON . an object with a breakable or sharp tip. switch. 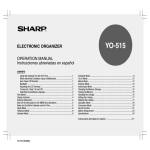 Noises or shocks may erase some or all of the Organizer’s memory. to select “4: BACKLIGHT SETUP”. to select “2: LCD CONTRAST”. press 2 to turn it off. the function, for example as introduced on page 31, “Shortcuts”. asking you to free up memory by deleting unnecessary space. : Mode key with only one function. letters or to access the symbols above the number key(*1) and “ , ” and “ ”. , press the desired key to be entered. them for operation are shown as unboxed numbers and letters. off by pressing CAPS . to exit the symbol entry mode. kinds of menus (see the following table). to clear all characters on the current display. • The initial Home city after initialization of the Organizer is New York. • “18.0” on the display indicates the time zone. to select “1: CLOCK SETTING”. 3. Press 1 to select “1: HOME CLOCK”. <Example> Set the date and time to April 12, 2001, 10:05 PM. 1. Press MENU PREV PREV 1 to select “1: CLOCK SETTING”. 2. Press 1 to select “1: HOME CLOCK ”. 5. Press ENTER . The clock starts from 0 second. 2. Press 2 to select “2: WORLD CLOCK”. to select “2: WORLD CLOCK”. to move the cursor to the city name line. PREV PREV 1 to select “1: CLOCK SETTING”. press 2 to select “24” (24-hour). The date format can be switched between MONTH/DAY/YEAR and DAY. DAY/YEAR” or “DAY. MONTH. YEAR”. following order: NAME → E-MAIL → NUMBER → ADDRESS. Further, Telephone/E-mail listings provide 2 files (TEL/MAIL1, TEL/MAIL2). 3. Perform the same procedure as step 2 for TEL/MAIL2 and URL. to check the new file name(s). “STORED !” will be displayed briefly, then the listing will be displayed. then the listing will be displayed. WWW listing consists of 3 entries: name, URL, and remark. displayed. Use the following keys to control the display status. mark is attached to the years 2000 to 2099. • When you reset the Organizer, the calendar defaults to Jan. 1, 2000.
the current date (April 12, 2001). the desired date in Calendar mode” (from step 4) on page 10.
format selected in the Time System of the MENU functions. lowercase letters, press CAPS . the listing is stored in the memory. once or twice to display the Schedule mode screen. The time entry prompt (or Calendar) for June 26, 2002 is displayed. desired date in Calendar mode” from step 4 (or from step 3) on page 10. <Example> Recall the listing for June 22, 2001 (Meeting at 10:00AM - 11:00AM). 3. Press SCHEDULE to change to the Schedule mode. NEXT or PREV to display the desired listing in the Schedule mode. 4. Press MENU NEXT NEXT 1 to select “1: SCHEDULE ALARM”. 5. Press 1 to select “1: ON”. were before pressing MENU . arrives while you are transferring data or freeing up memory. • Press C•CE to stop the alarm sound. to select “2: ALARM SOUND”. sound is set to OFF. To Do mode is selected by pressing TO DO/ANN once or twice. display the To Do entry prompt. twice to cancel the entry. description for the new listing. 1. Press TO DO/ANN once or twice to display the To Do entry prompt. the total expenses for a single day or for a certain period. 1. Press EXPENSE to enter the Expense mode. 3. Press 1 to select “1: DAILY”. 10 digits including 2 decimal places. 3. Press 2 to select “2: PERIOD”. return to the date entry prompt. digits. For single digit months or days, enter “0” before the single digit. to select “2: EXPENSE REPORT”. result exceeds 12 digits, “∗, ∗∗∗, ∗∗∗, ∗∗∗. ∗∗” is displayed. to enter the date entry prompt. The maximum number of characters for each description is 512.
date and follow the next procedure. page 11) in the monthly calendar. 1. Press TO DO/ANN once or twice to enter the Anniversary mode. to select “2: MONTH/WEEK” to display the date entry mode. • The following situations may display the message shown below. “Deleting the Listings” on page 19.
exhausted. Replace them with new ones then try again to free up memory. • The backlight function does not work while the memory is being freed up. has been found, “NOT FOUND !” is displayed briefly. <Example> Display the Index in the Telephone/E-mail mode. Telephone/E-mail, WWW, Schedule, To Do, or Memo mode. 1. Enter the first character(s) of the desired name in each mode. the subsequent listing in sequential order will be displayed. E-mail, WWW, Schedule, To Do, or Memo mode. • Pressing NEXT and PREV scrolls the page forward and backward. select the desired listing, and press ENTER . In the index display, the order in which memos are recalled can be changed. to select the listing, and press INS . • The selected listing blinks. 4. Press ENTER to store the new order in the memory. to move the listing to the desired position. SCHEDULE once or twice to display the Calendar mode. • Pressing 2nd SCHEDULE displays the current date. to display the schedule contents. contents are the same as or similar to the previously stored listing. 22) and repeat the above procedure. “DELETE ? Y/N” will appear.
. “DELETE ? Y/N” will appear. delete them all at once. <Example> Delete all listings in the TEL/MAIL1 files. 3 to select “3: DATA DELETION”. 2. Press 1 to select “1: TEL/MAIL/URL”. 3. Press 1 to select “1: TEL/MAIL1”. TO DO (ALL): NEXT 1 1 . TO DO (DONE): NEXT 1 2 .
to select “3: DATA DELETION”. to select “2: SECRET DATA”. Before performing any calculation, press C•CE twice to clear the display. This mode has 2 types of conversions as shown below. 2. Press NEXT (or PREV ) to select the conversion number 1.
so that no unauthorized person can recall them. 2. Press 1 to select “1: HIDE SECRET”. Only one password can be registered, but many secret listings can be entered. 2. Press 1 to select “1: ON”. 3. Press ENTER to store it in the memory. <Example> Designate the listing for “ABC BANK” as secret. to select “4: SECRET MARK ( )”. 4. Press 1 to select “1: ON”. 5. Press 2 to select “2: OFF”. 2. Press MENU NEXT 3 to select “3: SECRET”. Registering a Password” on page 22.
unnecessary data on the receiving Organizer. memory has begun to be freed up automatically. • Turn both of the Organizers off first before connecting them with the cable. • After data transfer, the data on the transferring Organizer is preserved. • Turn off the secret function before transferring data by mode (p. 22). • The Auto power off function is disabled in all the transfer modes. can be transferred to the WWW directory. then try again to transfer data. receiving or transferring Organizer, or on both ones. the entry prompt. To transfer each listing, recall the desired listing. The following menus are displayed. the receiving Organizer in step 3. Backup data transfer is started. you cancel the restoration process. If any discrepancies are found, “VERIFY ERROR !” is displayed. data with an IBM compatible personal computer. Backup ................ Backs up all data in the Organizer to your PC. Restore ................ Restores data from a backup file into an Organizer. on a PC and download it into your Organizer. COM port on your PC. connector located on the left side of the Organizer. 1. Insert the PC Interface Software disk into your disk drive. 2. Click on the Windows [Start] button and then click [Run]. • Type in your disk drive name ("a:" in this example). Organizer, disable any virus checking software you may be running. 1. Connect your Organizer to a PC. 2. 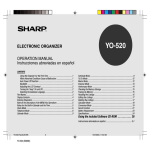 Click [Start] ➝ [Program] ➝ [Sharp YOZQ_b] ➝ [EO-Utility]. correctly made, you may need to select an appropriate port manually. The PC Interface Software Main Screen appears. and select the appropriate port. port to be selected automatically. • To cancel the backup process, click [Abort] on the instructions screen. Press MENU NEXT NEXT NEXT and 4 to select “4: BACKUP”. Then press Y to start the backup process. Click [Address Utility] on the Main Screen to open the Address Utility window. The dialog box appears asking you to choose the backup file name. 4. Click [NEXT >>] to start the restoration process. • To cancel the restoration process, click [NO]. and 5 to select “5: RESTORE”. <Example> Enter the following data as secret data in TEL/E-mail mode. • To cancel the transferring process, click [Abort] on the instructions screen. the data you typed in can not be sent. Organizer in the entry fields. 5. Click [New] to clear the input data in all entry fields. the same time. Doing so will clear the memory of its contents. Insert the battery with its positive side (+) correctly positioned. Never throw batteries into a fire because they might explode. immediately to avoid battery leakage and corrosion inside the Organizer. battery holder cover on the back of the unit. 4. Install 2 new batteries with the positive sides (+) facing up. may become depleted before the specified expiration time is reached. power does not come on, press the RESET switch. Organizer, so that you know when to replace the battery the next time. replace these before replacing the memory backup battery. This Organizer has 9 shortcut keys to provide rapid access to the menus. Turns the Schedule alarm on and off. Sets or deletes the password. Turns the alarm sound on and off. Turns the key sound on and off. • Do not use a mechanical pencil or sharp pointed object. the display again, replace the operating batteries. distinguishing between morning, afternoon, and anniversary. per hourly use and Backlight is on for 2 minutes per hourly use. interruptor RESET y luego suelte ON . Aparece “CLEAR ALL DATA OK (Y/N)?”. impaired! Press [Y] to CLEAR ALL memory”. 3. El Organizador se ha inicializado. minutos. (El tiempo real puede variar según las condiciones de utilización). Pulse ON para reanudar la operación. no se active ninguna tecla durante el período definido por usted. SETUP” (4: Ajuste de luz de fondo). encontraba antes de pulsar MENU . 3. Pulse C•CE para ajustar el contraste. 1. Pulse CLOCK una o dos veces para que se visualice el reloj local. 4. Introduzca la hora y los minutos. 7. Pulse MENU PREV PREV 1 para seleccionar “1: CLOCK SETTING”. 8. Pulse 2 para seleccionar “2: WORLD CLOCK” (2: Reloj mundial). 2. Pulse 1 para activar el sonido de las teclas, o 2 para desactivarlo. si desea desocupar la memoria borrando datos innecesarios. orden respectivo en la pantalla. pulsa TEL o E-MAIL . 1. Pulse WWW para visualizar el indicador de entrada de URL. para visualizar el modo de calendario. Call Frank about a sales meeting ENTER . de 0 a 9, A a Z, seguido de espacio. 1. Pulse MENU 2 para seleccionar “2: INDEX”. 1. Pulse MEMO para que se visualice el indicador de entrada de notas. 2. Introduzca la fecha para el gasto. 3. Introduzca el importe de los gastos. 1. Pulse TO DO/ANN una o dos veces para entrar al modo de aniversario. de la fecha visualizada actualmente, en orden progresivo (o regresivo). 3. Pulse 2nd NEXT . Los listines llamados se visualizan en la pantalla, uno por cada línea. pantalla del modo de teléfono/correo electrónico. 1. Pulse SCHEDULE una o dos veces para visualizar el modo de calendario. • Pulsando 2nd SCHEDULE se visualiza la fecha actual. desplazarse a la fecha con una etiqueta. 3. Pulse SCHEDULE para visualizar el contenido del programa. Llame un listín en el modo deseado. Pulse MENU 1 para seleccionar “1: EDIT” (1: Editar). Se accede al modo de edición y el cursor destella. Modifique los datos según se desee. Pulse ENTER para almacenarlo en la memoria. 1. Llame el listín que desea borrar. Aparecerá “DELETE ? Y/N” (¿Borrar? Sí/No). 3. Aparecerá “DELETE ? Y/N” (¿Borrar? Sí/No). • Para cancelar la operación de borrado, pulse N .
2. Pulse NEXT (o PREV ) para seleccionar el número de conversión 1. 3. Pulse MENU 1 para seleccionar “1: EDIT” (1: Editar). Para convertir la unidad A en la unidad B, pulse . Para convertir la unidad B en la unidad A, pulse . C•CE para borrar el resultado y realizar otra conversión. respaldo de la memoria, pues podrá perder los datos de la memoria. importante almacenada en la memoria. observe al pie de la letra las siguientes instrucciones. • Inserte la pila con su lado positivo (+) correctamente posicionado. • Nunca arroje las pilas al fuego pues podrán explotar. • Mantenga las pilas fuera del alcance de los niños. para evitar el riesgo de derrames y corrosión en el interior del Organizador. fábrica, podrían agotarse antes del tiempo de vida útil especificado. no se encienda durante el período establecido o no se encienda para nada. pilas o por la negligencia en la observación de las siguientes instrucciones. • Asegúrese de apagar la unidad antes de cambiar las pilas. 1. Pulse OFF para desconectar la alimentación. 3. Extraiga las pilas usadas con un bolígrafo o similar. 3. Extraiga el sello de la pila de respaldo de la memoria. la alimentación no se conecta, pulse el interruptor RESET. 7. Ajuste el reloj a la hora correcta. • Cambie la pila cada 5 años. Organizador para poder saber cuándo debe cambiar la pila. cambiar la pila de respaldo de la memoria. 4. Extraiga la pila usada con un bolígrafo o similar. • No emplee un lápiz mecánico ni un objeto puntiagudo. se visualiza nada, cambie las pilas de funcionamiento.